Do you feel up to a challenge? 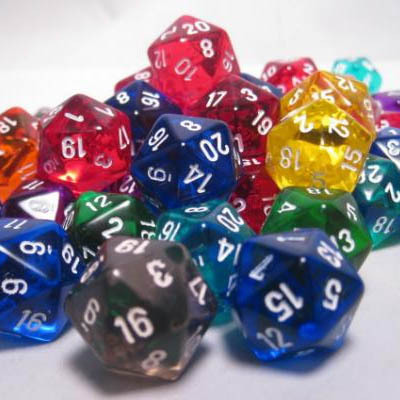 Are you prepared to let a 20 sided dice decide the course of an evening’s adventure? Then why not come along to a pub night with a difference! On Saturday 5 May, we’ll be meeting at 5pm by the Information Booth at Federation Square. On the night, the dice is our god and will choose where we go and what we drink. The roll of a D20 will decide the venue (we’ve got a great list of 20 bars & pubs to choose from) and a D6 will decide on drinks. There is no cost to join in the fun, but you will be responsible for your own food and drinks (plus any venue cover charges if applicable). This is an over 18 event as there will be alcohol involved. Comfy shoes should be worn as there will be some walking (but hopeflly not to much), and you should make sure that you have a safe way of getting home – no driving if you’re drinking! More details and news is on our Facebook page.